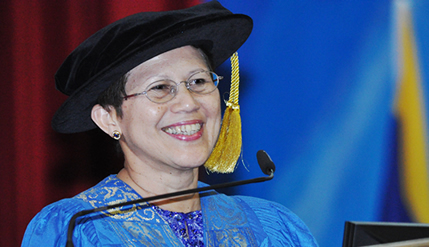 BANGI, 21 Oct 2012 – Efforts of The National University of Malaysia (UKM) to instill entrepreneurial qualities in all its students have shown positive results. Speaking at the third session on the second day of the university’s 40th convocation here today, Vice Chancellor, Prof Tan Sri Dato’ Wira Dr Sharifah Hapsah Syed Hasan Shahabudin gave a number of examples of the success of UKM’s Academic Entrepreneurship programmes. One example is a female Science and Technology (FST) graduate who is the CEO of one of its start up companies, Serotech Sdn. Bhd. which has successfully marketed Chili Bangi internationally. Another graduate also from FST has successfully launched an internet company. She said these are testimonies that UKM not only produces graduates who are knowledgeable but are capable of starting and running companies which are technologically based. Prof Sharifah Hapsah said UKM endeavors to provide a knowledge ecosystem that will bring out the best qualities in its students and where they will be trained in all aspects to become an all rounder. Various other examples were also given of successes achieved by some of its students including Ng Shay Lee from the Faculty of Dentistry who won the first place in a poster competition in the Asian Region Ceram-X Case Contest last June in Hong Kong and another who won first place in a poster competition in the 4th National Dental Students Scientific Conference 2012. A student from the Medical Faculty, Izreen Supa’at became the champion in the Young Investigator Award at the 9thAnnual Scientific Meeting of the Malaysian Society of Hypertension and Young Investigator Award at the 46th Malaysia-Singapore Congress of Medicine. Other examples she gave include a third year Actuarial Science students, Enn Choo Choon who won a prestigious scholarship from John Culver Woody in America. The scholarship was given to outstanding students from reputable universities. Pro Chancellor Tunku Laxamana Tunku Naquiyuddin Ibni Almarhum Tuanku Ja’afar, Deans of Faculties, lecturers, graduating students and their families attended the session.